On March 25, 2016, the EO-79 SSB/CW transponder was activated and will be available during Easter. 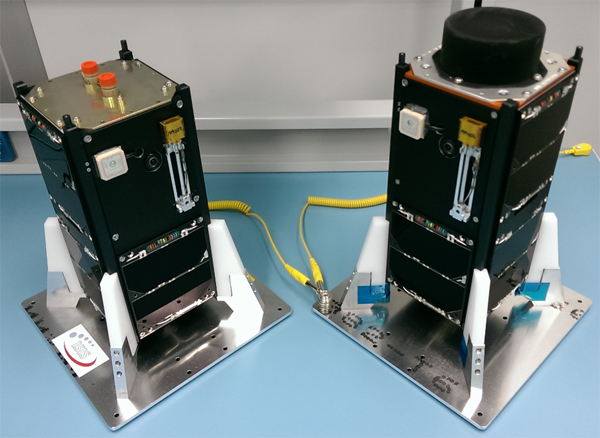 The FUNcube transponder subsystem on QB50p1 (EO-79) had been provided by AMSAT-UK and AMSAT-NL and is a similar subsystem as on FUNcube-1, but without the telemetry downlink circuitry. The current software running on EO-79 does experience occasional reboots. When these reboots happen, the transponder is automatically turned off and will have to be turned back on by a command station. The FUNcube team has selected a few command stations to do so, but be advised the transponder may be off. Just like FUNcube-1, the crystal oscillator circuits exhibit drift with temperature. This means manual tuning will probably work best. It does not appear in the table, but it does in the reporting drop-down. The EO-79 CubeSat SSB/CW transponder will be active from Monday, December 28 until Thursday, December 31. The team has seen that activating the transponder makes the satellite power negative, meaning the solar arrays cannot generate enough power to keep the transponder running permanently. This is not unexpected as the satellite is operating in a different mode than originally anticipated during the design phase. The team are discussing various ways to solve this, including multiple ways of scheduling the transponder operations. With these discussions ongoing we would still like to try the second activation and obtain some more data about the system. The team aim to activate the transponder for as much time as the power budget allows, but please be aware that you may find the transponder to be off while the batteries recharge. We kindly request you to share your experiences with the AMSAT Bulletin Board so everyone can benefit from operating tips and tricks, as well as being up-to-date on the status. We would also welcome any observation related to the transponder behaviour when the AX.25 beacon comes on. Graham Shirville G3VZV says that due to platform sharing considerations the FUNcube transponder on EO-79 uses 1/4 wave monopole antennas rather than the full dipoles used on AO-73. The actual effects of this difference in practice may be interesting to observe. On December 21, 2015 at 1038 UT, the EO-79 transponder was turned on for a prolonged period. Wouter Weggelaar PA3WEG has provided this update on the status and plans for QB50p1 – EO-79. Earlier testing campaigns indicate that the AMSAT-UK/AMSAT-NL transponder on board of this spacecraft is in good health. We have activated the transponder on various occasions for testing purposes. At the moment we believe the power system is capable of sustaining transponder operations indefinitely. ISIS (the satellite designer and operator) still needs to write and apply a software patch that would keep the transponder running. The current logic in the satellite will switch off the transponder if a reset occurs of the On Board Computer or power system. Efforts are being made to allow usage of the transponder in the mean time and also allow select command stations to take the satellite out of safe mode if it does reset. ISIS will continue to monitor all telemetry and the satellites health. The precursor satellites have gathered valuable data about the sensor payloads, and the lessons learnt are being implemented in the flight units for the QB50 main mission. We will still have to wait until procedures are in place and the activation is cleared by the operator and owners of the satellite, but we are nearly ready for the activation of another transponder! Transponder activations will be announced on the AMSAT Bulletin Board. On behalf of AMSAT-NL and the ISIS operations team I would like to thank the community for supporting our mission and thank you for your patience.